Our product range includes a wide range of pinewood saddle, export pinewood saddles, packaging solutions with saddle & lashing, heavy duty saddle and export heavy duty wooden saddles. 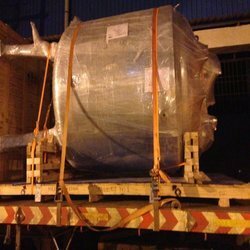 Engaged in offering wide range of Packaging Materials & services such as Pinewood Saddle, industrial palletization services, fumigation services along with wooden pallet, wooden crate, wooden box, polypropylene strap, stretch film, dunnage bags, bag packing machine, corrugated box, lashing shrink wrap. Engaged in offering a wide range of Packaging Materials & services such as Export Pinewood Saddle, industrial palletization services, fumigation services along with wooden pallet, wooden crate, wooden box, polypropylene strap, stretch film, dunnage bags, bag packing machine, corrugated box, lashing shrink wrap. We offer a comprehensive range of Packaging Solutions. These are made from the strongest quality wood. The range is tested for durability and quality by our team of experts. The raw material required is purchased from the most trusted vendors. We also customize out range to suit client requirements. We have expertise in manufacturing & supplying a broad range of Heavy Duty Saddle which is made of optimum quality wood. 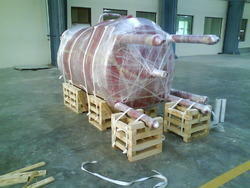 We are providing Export Heavy Duty Wooden Saddles. These Saddles are made from High-Quality Wood. 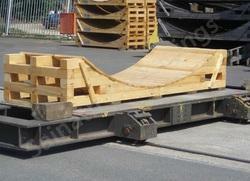 Looking for Export Wooden Saddles ?